EXPIRED Free Dining at Disney World no longer valid - Pixie & Pirate Destinations *|* Wishes become memories. One dream at a time. This offer has expired. Please contact us for other discounts available for Walt Disney World. Free Dining at Disney World - Book by Oct. 29! 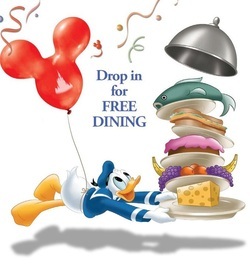 It's your last chance to book your 2011 FREE DINING package at Walt Disney World! Contact Pixie and Pirate Destinations today so you don't miss out on this offer ending October 29, 2011! See the example packages below. Example Disney World Free Dining packages - based on availability - HURRY!